I live in a little subdivision called Hawaiian Shores in Pahoa on the Big Island of Hawaii. I really don't know how to describe my artistic style, other than the fact that I'm brand new at this. I've only been beading since the end of January 2009. After a long day at school working with students in grades 7-12, I love to come home and make Swarovski crystal bracelets. It's how I wind down. I enjoy working with all of the different colors and trying new combinations with several types of precious gems. Several things inspire me. From the color combinations on a Thank You card I received from my step-mother, to my latest craze of designing different angel bracelets for the holidays. So far, my bracelets always include Swarovski crystals. But I love combining them with Swarovski and cultured pearls. I also love all of the different combinations I can come up with using the 11/0 seed beads. I call this a White Pearl and Crystal Bracelet. I remember my step-sister's bridal gown at her wedding a few years ago. It was so beautiful with lots of pearls sewn onto the bodice. I decided to combine white cultured pearls with the Swarovski crystals and seed beads to see what that would look like. I was delighted with the result! That's what makes it so much fun for me. 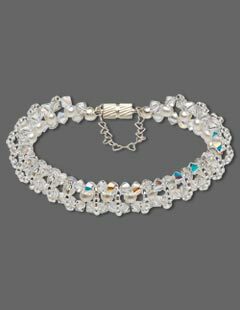 I happened to walk into a Ben Franklin store in late January '09 when they had a ''make and take'' Swarovski crystal heart bracelet lesson. I wrote down all of the steps, purchased some more beads, and decided that the only way I could remember how to make that bracelet was to teach someone else. So I invited several lady friends to my house for a potluck lunch/bracelet lesson the following month. I had 12 women show up on Saturday, who ranged in age from 17 to 72. They all asked me when the next lesson was going to be scheduled. So I scheduled another potluck lunch bracelet party in March, and I've had the potluck lunch beading party ever since. I don't charge for lessons and since I have invested heavily in the tools and beads, the ladies can purchase their supplies from me at cost and not have to worry about not having enough wire or crimp beads or whatever beads they choose to work with. The Hilo Ben Franklin Assistant Manager, Kayleen, was the teacher for my first lesson. She actually agreed to come to one of our potluck lunch/beading parties and teach us how to make the Swarovski crystal flower bracelet. I've been beading ever since and I love it! I used to love photography before the digital cameras became popular, but lost interest after having three cameras stolen. I was thinking that it was some kind of karma or message that I should pursue another hobby. One of the ladies that came to my beading party, Malia, told me about ordering beads online and she gave me the website. I've actually started our own monthly beading group at my house. I've been asked if I'd like to teach seniors at our local Pahoa Community Center. Perhaps we can get a seniors group started, as well. I don't have much time for other hobbies since I've started beading. I still love to read, though... when I'm not making bracelets. Traveling is my other passion, especially with my boyfriend, Barry. We recently spent a month in Provence, France over my summer break from school. My real job is a college/career counselor. Beading is my way of winding down after working with kids all day at school. I enjoy exploring my creative side. This is something I've never done before and I find it kind of addictive. I'm constantly thinking of new color combinations and designs and I never get bored. I have donated several of my bracelets for silent auctions and drawings for various fundraisers over the past six or seven months. As a beginner myself, I don't have any advice except that you shouldn't invest too much money into something unless you're sure that it is something you'll enjoy doing for a long time.